Yi B, Ozerova M, Zhang GX, Yan G, Huang S, Sun J. Post-Transcriptional Regulation of Endothelial Nitric Oxide Synthase Expression by Polypyrimidine Tract-Binding Protein 1. Arterioscler Thromb Vasc Biol. 2015 Oct;35(10):2153-60. doi: 10.1161/ATVBAHA.115.305750. Lundberg JO, Gladwin MT, Weitzberg E. Strategies to increase nitric oxide signalling in cardiovascular disease. Nat Rev Drug Discov. 2015 Sep;14(9):623-41. doi: 10.1038/nrd4623. Saha S, Chakraborty PK, Xiong X, Dwivedi SK, Mustafi SB, Leigh NR, Ramchandran R, Mukherjee P, Bhattacharya R. Cystathionine β-synthase regulates endothelial function via protein S-sulfhydration. FASEB J. 2015 Sep 24. pii: fj.15-278648. Thoonen R, Cauwels A, Decaluwe K, Geschka S, Tainsh RE, Delanghe J, Hochepied T, De Cauwer L, Rogge E, Voet S, Sips P, Karas RH, Bloch KD, Vuylsteke M, Stasch JP, Van de Voorde J, Buys ES, Brouckaert P. Cardiovascular and pharmacological implications of haem-deficient NO-unresponsive soluble guanylate cyclase knock-in mice. Nat Commun. 2015 Oct 7;6:8482. doi: 10.1038/ncomms9482. Xia N, Horke S, Habermeier A, Closs EI, Reifenberg G, Gericke A, Mikhed Y, Münzel T, Daiber A, Förstermann U, Li H. Uncoupling of Endothelial Nitric Oxide Synthase in Perivascular Adipose Tissue of Diet-Induced Obese Mice. Arterioscler Thromb Vasc Biol. 2016 Jan;36(1):78-85. doi: 10.1161/ATVBAHA.115.306263. Godo S, Sawada A, Saito H, Ikeda S, Enkhjargal B, Suzuki K, Tanaka S, Shimokawa H. Disruption of Physiological Balance Between Nitric Oxide and Endothelium-Dependent Hyperpolarization Impairs Cardiovascular Homeostasis in Mice. Arterioscler Thromb Vasc Biol. 2016 Jan;36(1):97-107. doi: 10.1161/ATVBAHA.115.306499. 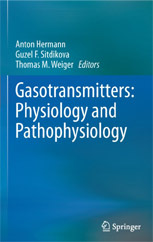 Szabo C. Gasotransmitters in cancer: from pathophysiology to experimental therapy. Nat Rev Drug Discov. 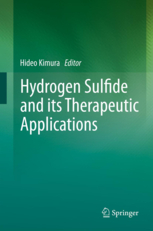 2015 Dec 18. doi: 10.1038/nrd.2015.1. Velmurugan GV, Huang H, Sun H, Candela J, Jaiswal MK, Beaman KD, Yamashita M, Prakriya M, White C. Depletion of H2S during obesity enhances store-operated Ca2+ entry in adipose tissue macrophages to increase cytokine production. Sci Signal. 2015 Dec 15;8(407):ra128. doi: 10.1126/scisignal.aac7135. Abraham NG, Junge JM, Drummond GS. Translational Significance of Heme Oxygenase in Obesity and Metabolic Syndrome. Trends Pharmacol Sci. 2016 Jan;37(1):17-36. doi: 10.1016/j.tips.2015.09.003.